Do You Need to Get French Currency Before You Travel? Should I bring euros with me on my trip to Paris? Or wait to exchange dollars or other currency to euros until after I arrive? What are the best places to exchange dollars for euros in Paris? How can I avoid paying too much in currency exchange and service fees? These are just a few of the most frequently asked questions about French money asked by first-time visitors to Paris. Although you may feel confused about the best way to get euros, the process is easier and simpler than you might expect, especially if you have up-to-date information and avoid a couple of expensive pitfalls. 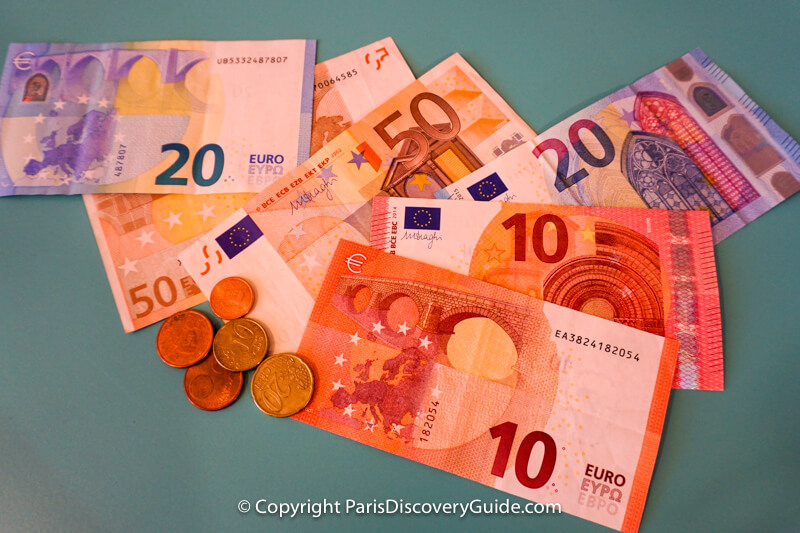 Our answers to these FAQs about Euros for your Paris trip plus our tips about when to use euros vs your own currency to pay for things in Paris will tell you everything you need to know - and hopefully save you some money! Do I Need to Get French Money Before I Arrive in Paris? You may want to stop for a coffee and croissant in the airport before heading into Paris. To pay with a credit or debit card, a minimum purchase of 10€-20€ may be required. Having some cash avoids the need to buy a few extra croissants to meet the minimum - or worse, having to pass on the coffee. If you are taking a taxi, the RER train, or a bus into the city, you may want the convenience of paying in cash. For example, if you take the Roissy bus to Paris and have euros, you can buy your ticket on board - easier and faster than waiting in line to buy a ticket at the RATP machine at the airport. Taxis operating in and out of the Paris airports are required to take credit cards, but the machines don't always work; having euros in cash avoids an unplanned stop at an ATM. If you want to tip your cab driver, you will need euros because in most cases, you cannot add a tip to a credit card transaction in France. There is always the slight chance that your credit card(s) or ATM card will not work - for example, if you forget to notify your credit card company or bank before you leave home about your travel plans, they may freeze your card when they see a transaction from France. An emergency stash of euros will come in handy until you get the credit card or ATM situation straightened out. So yes, having a small amount of cash in euros when you arrive in Paris is always a good idea. How & Where Do I Get Euros in the U.S. Before My Trip? In the United States, the cheapest place to buy euros with dollars is at your bank or credit union because you'll usually get close to the "market" exchange rate and pay low, if any, service fees. Your bank or credit union may need a week or more to order and receive foreign currency, so be sure to allow plenty of time. Other options include travel service clubs such as AAA (United States) and CAA (Canada). Exchange rates may be lower (ie, you'll get fewer euros for your dollars) than you'd get at your bank, and you will typically be required to pay a service fee and perhaps a delivery fee. Contact your local club office to inquire about charges, as these vary by region. As with banks, order your euros at least a week in advance. Travelex and money exchange companies are another option. You'll usually get a lower exchange rate than at your bank - but you may find this to be the most convenient option. Travelex lets you pick up your euros at a local office or your departure airport, or choose home delivery. Shipping is free on orders over a certain amount (typically $1,000); otherwise, you'll pay a shipping fee. The best part? Travelex is fast. You can usually get your euros by the next day. And you can't beat the convenience of home delivery. Bottom line: What is the best way to get Euros before you travel? The cheapest way will be through your bank. The quickest and most convenient way may be through Travelex or a similar service. If you need only 100€-200€, the cost difference between the two options is typically less than what you'd pay for a couple of grande mocha lattes at Starbucks. How Much Cash (Euros) Will I Need Each Day during My Trip to Paris? If you use this approach. all you need to do is figure out how much cash you'll need each day for tips and other small expenses, and multiply the amount by the number of days you'll be in Paris. Should I Get Travelers Checks for My Trip to Paris? No. 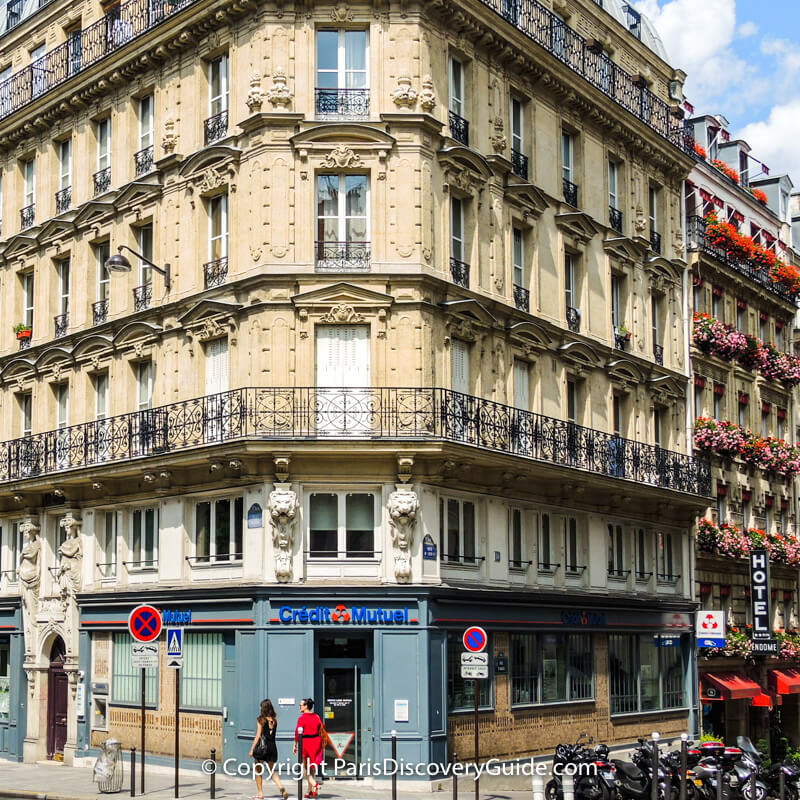 Travelers checks haven't been widely accepted in hotels, restaurants, stores, or other businesses in Paris for decades. ATMs, credit, and debit cards have made them effectively obsolete in France. Can I Get Euros in Charles de Gaulle Airport? Yes. You will see Travelex machines, which look almost exactly like ATM machines, in numerous places at CDG, especially in Terminal 2 where most international flights arrive. But ... you need to be aware of an important and costly difference. Although using Travelex for currency exchange before you leave home can be a great deal because of its speed and convenience, the airport Travelex machines have a potentially costly pitfall you should avoid: an option to charge your transaction in your home currency such as dollars which will cost you a lot more if you choose it. Why? Being charged in your own currency when you're in another country is what's called dynamic currency conversion, or DCC. Basically, DCC allows the ATM owner to add whatever rate they want up to 15% on top of the basic conversion fee (usually 1%), and any other foreign transactions fees your bank might charge. So you could be looking at close to 20% extra in additional conversion rates and fees. If you didn't get euros before leaving home and want to get some at the airport, go ahead and use the Travelex machines - but just say "NO" when asked if you want to be charged in your own currency. Always choose the local currency, euros, to avoid extra charges. Consider limiting your transaction to 100€-200€, as you can get a better deal at bank and credit union ATMs once you're in Paris. What about bank ATMs at the airport? 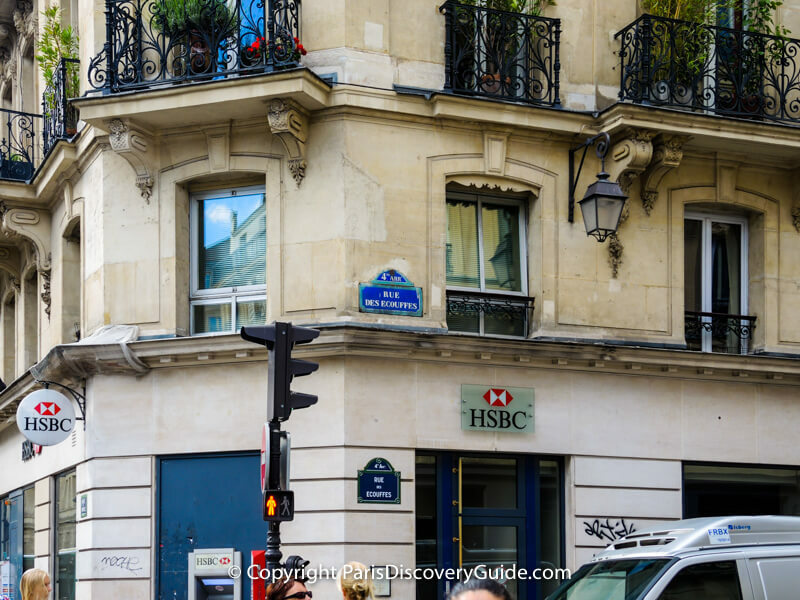 Unfortunately, the only bank that has an office and ATM at Charles de Gaulle at this time is HSBC, which is located in Terminal 2 in the shopping area between Terminals 2D and 2F. It is accessible Monday through Friday, 8:45am-5pm. If you can find it, you'll get a better exchange rate and not have to deal with the "do you want to be charged in your own currency" question but searching for it may not be worth the hassle. You may also see Bureaux de Change (currency exchange office) at the airport. Avoid them. They provide poor exchange rates and charge exorbitant fees. Statistically, Paris has a very low crime rate, especially when compared with other cities - but pickpocketing is the most common crime. You can greatly reduce your chances of becoming a statistic by exercising a few common-sense tactics, such as keeping your wallet in a front pocket and holding onto your pocketbook at all times. What Is the Best Place to Get Euros in Paris? Use your ATM (ie, debit) card to get cash (in euros) just as you would at home. French ATM machines offer English-language instructions, and they're easy to use. There's no need to worry about which French bank gives the best conversion rate - they offer same rate, although the rate itself is dynamic and changes slightly throughout the day. French banks, by agreement, do not add any withdrawal fees or charges on ATM withdrawals, regardless of the ATM card you use. However, your home bank may add fees for "out of network" withdrawals and currency conversion. Other banks don't do this. Check and understand your bank's fee structure before you go. Know your bank's daily ATM withdrawal limit in dollars, and is in Euros. If your bank's limit is $300 and the current exchange rate is 1 USD = 0.89 Euros, you can withdraw only 266€. If you try to withdraw 300€, that converts to $345, and your bank will decline your withdrawal. 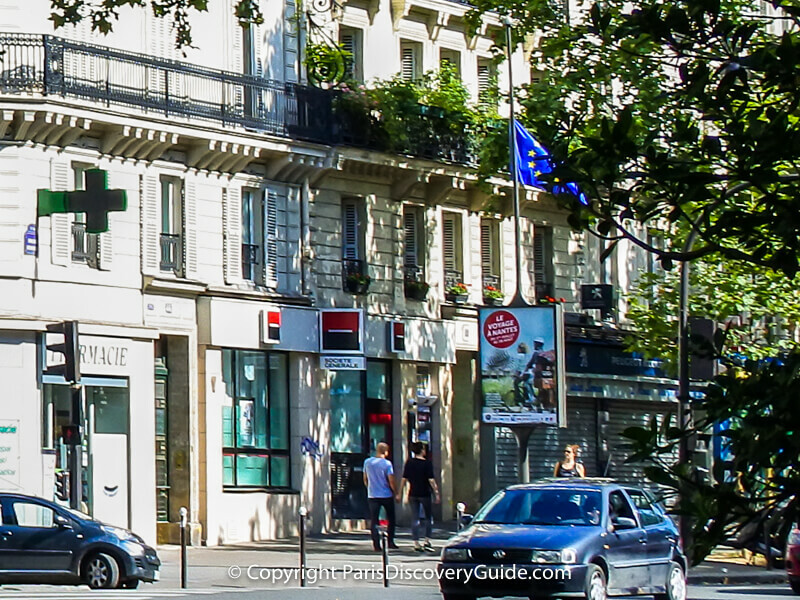 The Paris bank may also have an ATM withdrawal limit. Using this same example, if the Paris bank has a 200€ ATM limit, your transaction will be declined. What Is the Worst Place to Get Euros in Paris? What Should You Avoid? The worst place is any ATM machine that looks sketchy. In fairness, most ATMs in Paris are legit, and especially if you use only those clearly connected to banks, you should have no problem. However, renovations and rebuilding are common in Paris, and occasionally you'll see an ATM machine that appears to still be operational even though the building around it is in an obvious state of being dismantled or rebuilt. Does the ATM machine still work? Don't find out. Don't risk watching your card disappear into it, never to be seen again. Otherwise, unless you're at Charles de Gaulle and don't have other options, avoid getting euros from non-bank ATMs such as Travelex, Euronet, and others, no matter how new and shiny they look. Remember the potential DCC (dynamic currency conversion) rip-off and poor exchange rates? Why pay more than you need to when bank ATMs are available all over the city? Also avoid getting euros at bureaux de change due to their poor rates/high fees. Should I Bring Dollars & Exchange Them for Euros in Paris? There no need to bring dollars to Paris in order to change them into euros - so do not do it. Bureaux de change offer poor exchange rates and charge exorbitant fees. Many Paris banks will now do currency exchanges only for their own customers. 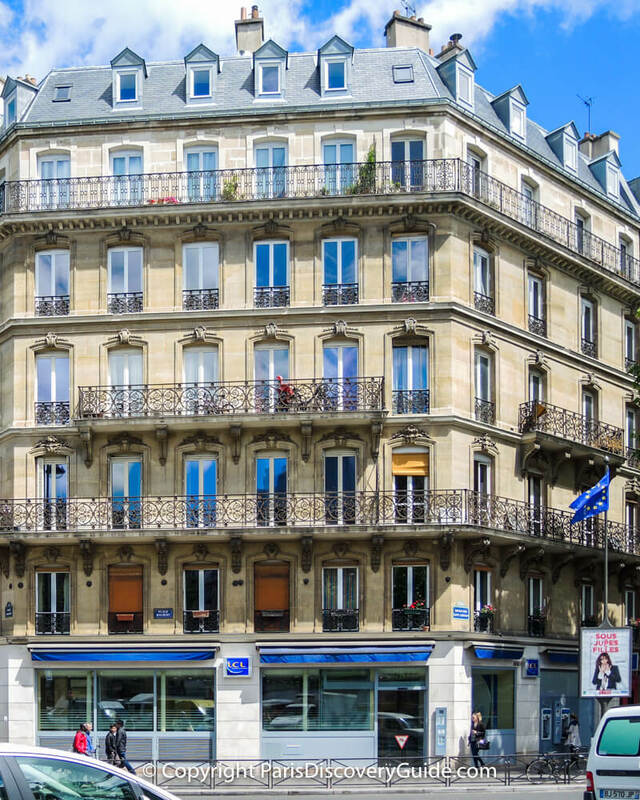 Decades ago, hotels would exchange dollars for euros at somewhat better rates than bureaux de change, but most no longer do so. In any case, you'll get a better deal by using your ATM card to get cash at bank ATMs. Should I Bring a Prepaid "Cash" Card to Use in Paris? Maybe - it depends on what's available in your home country, and how much they cost. Prepaid cash cards let you load the card with cash before you travel, and then you use it just like a credit or debit card. Prepaid cards in the US are usually not a good deal because you have to "buy" the card or pay relatively high fees. You'll usually save money by using your regular ATM, credit, or debit card instead, especially if you pay your credit card balance each month to avoid interest. In some other countries such as Canada, you can get prepaid cash cards without paying any extra fees, so they're a fine alternative - but do bring an ATM and/or credit/debit card as a backup in case you need more money beyond what's on your card. Can I Use My Credit Card to Get Cash? You can, but don't do it except in an emergency because it's a very expensive way to get money. Your credit card company will treat the transaction as a "cash advance" and will charge a sizable fee plus a high rate of interest, possibly 20% or more depending on your card. If you think you might ever need to do this, make sure you know your PIN (in numbers). Euros come in bills and coins, based on the denomination. Bills are available in denominations of 5, 10, 20, 50, 100, 200, and 500 euros. Coins are in denominations of 1 and 2 euros. The euro is divided into 100 centimes, which come in coins with denominations of 1, 2, 5, 10, 20, and 50 cents. Currently, you can use euros in 19 Eurozone countries within the European Union: Austria, Belgium, Cyprus, Estonia, Finland, France, Germany, Greece, Ireland, Italy, Latvia, Lithuania, Luxembourg, Malta, the Netherlands, Portugal, Slovakia, Slovenia, and Spain. In the pre-euro days, each of these countries used a different currency which meant you had to convert money every time you crossed a border. No need to do that anymore! How Do I Know If I'm Getting the Right Dollar to Euro Exchange Rate? As long as you use your ATM card at a bank ATM to get euros, you're getting the best conversion rate available to individuals (sometimes called the "retail" rate) at that moment. Want to know the current institutional exchange rate? Use XE Corporations' currency converter to get an approximate idea - but remember, the institutional rate is always better than the rate you, a consumer, will get. What If I Have Euros Left at the End of My Trip? If you plan another trip to France or another Eurozone country in the future, plan to keep 100-200€ in bills for your return trip. Put that amount aside, and spend the rest during your last few days in Paris. If you still have more euros than you want to retain or if you're not sure if you'll return to Europe during the next few years, the most convenient place to exchange euros for dollars (and get a decent conversion rate) is probably your local bank. They will exchange bills but not coins - so spend your coins before you leave Paris. Need More Reasons to Visit Paris?